The father of Williams driver Lance Stroll insists he still believes in the team, despite claiming the team got their car wrong for the 2018 Formula 1 season. Williams sit at the bottom of the constructors’ championship standings after the first five races of the year, with Stroll’s eighth-placed finish in Azerbaijan giving the team their only points finish so far. Lawrence Stroll, who reportedly spent $80m in order to secure his son’s seat in F1, says he hasn’t started looking for a different race seat for the 19-year-old for next season. Speaking to Autosport, Stroll Sr did described this season’s performance as a “rude awakening”, but claims he believes in the team and is optimistic they’ll be able to make the car more competitive as the season progresses. The businessman goes on to state it’s “pretty apparent” what’s wrong with the FW41, and that a blind person could spot the problem, insisting the team are working hard to fix it. Stroll was also complimentary of his son’s performances for Williams so far this year, lauding Lance’s driving as “phenomenal”. Stroll Jr has finished every race so far this season, beating teammate Sergey Sirotkin on each occasion, although he does have more F1 experience than his rookie teammate. Williams’ qualifying pace has been a problem all year, with Stroll being eliminating in Q1 in three of the five races so far this year. However, he’s made up places during the race in the last four Grand Prix, and narrowly missed out on points again in Spain despite starting 18th. Lawrence Stroll isn’t the only person to have criticised the FW41 in the last week. The team’s test and reserve driver Robert Kubica took Sirotkin’s car out in FP1 at Barcelona, before admitting he felt embarrassed driving a car with such a lack of pace and poor handling, although he did finish the session with a faster lap time than Stroll. 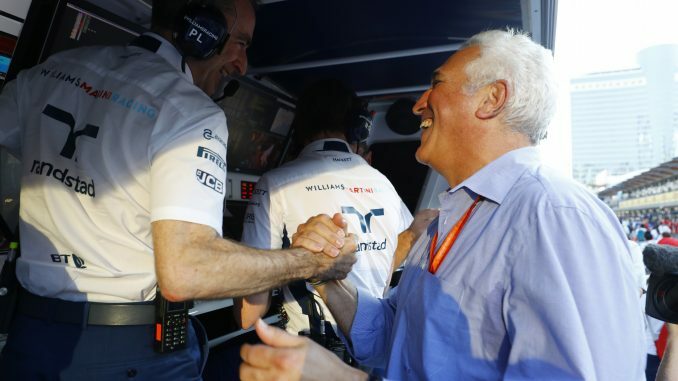 Lawrence Stroll insists he has no influence over the team, and that he’s only Lance’s dad, but his comments will be an issue for the team’s management. Potentially losing a driver with such strong financial backing to another team on the grid could be problematic for a team that doesn’t have the largest budget on the grid.